This is a very different kind of inkjet printer. It helps you save up to 50% on the cost of ink by using KODAK VERITÉ 5 ink. It helps you use up to 30% less ink with the all new Eco Button. And it comes with high capacity ink cartridges right in the box. The extra ink in the box is a $64 value alone. It scans straight to your smartphone and lets you print photos or an address for an envelope wirelessly with just a flick. Say hello to the all-new KODAK VERITÉ 55 XL Plus Wireless Printer. This easy to use printer is perfect for anyone that is tired of paying for high cost ink. It’s very easy to use, very easy to set up, and very easy on your budget. We think you will be surprised by the quality of the pages and even photos that you can print while using 20% and 30% less ink. Easy wireless printing from your smartphone, tablet, PC, or laptop. AirPrint™ and Google Cloud Print™ compatible. Wirelessly scan to your smartphone or table using the free KODAK VERITÉ Printer app. With the KODAK VERITÉ Printer app, you can print photos with a flick directly from your smartphone or tablet. With the KODAK VERITÉ Printer app you can print an address from your smart phone wirelessly to an envelope in your print with just a touch. Use the free KODAK VERITÉ Printer app to connect and set up your printer in minutes. Easily install and and change ink cartridges through the easy access cartridge bay door on the top of the printer. Two inch LCD to easily navigate through the printer menu options. Secure printing from a laptop or PC through USB 2.0 (USB cable not included). Why did we include so much ink with the KODAK VERITÉ 55 and make it so affordable to buy new cartridges? Why do we have the Eco Button that will allow you to use up to 30% less ink? Because we think you should be excited to print. Not worried about what you’ll spend. Print 2x the number of pages as compared to standard size KODAK VERITÉ 5 Ink Cartridges. And use 20-30% less ink with the new Eco Button. Ink value is calculated based on the cost per page for standard cartridge suggested retail price multiplied by the page yield of the included XL cartridges. The Eco button helps you use less ink, but only if you want to. You chose the savings. The Eco button can be controlled from the KODAK VERITÉ App or directly on the printer. We think you will be surprised by the quality of the pages and even photos that you can print while using 20% and 30% less ink. A printer should be as easy to use as a toaster. And setting up your printer should be easy too. That’s why we created the KODAK VERITÉ Printer app. or laptop. AirPrint™ and Google Cloud Print™ compatible. Wirelessly scan to your smartphone or tablet using the free KODAK VERITÉ Printer app. One button to make copies. Up to 6 copies per minute. Reduce or enlarge the size of the print 25-400%. Interested in the full specifications for this KODAK VERITÉ 55 XL Plus Wireless Printer? Take a look at the dropdown chart below for all the details. Ink page yield values for color graphics and text document obtained by continuous printing in accordance with ISO/IEC 24711. Actual results may vary. ©2017 Funai Electric Co., Ltd. The Kodak trademark and trade dress are used under license from Eastman Kodak Company. 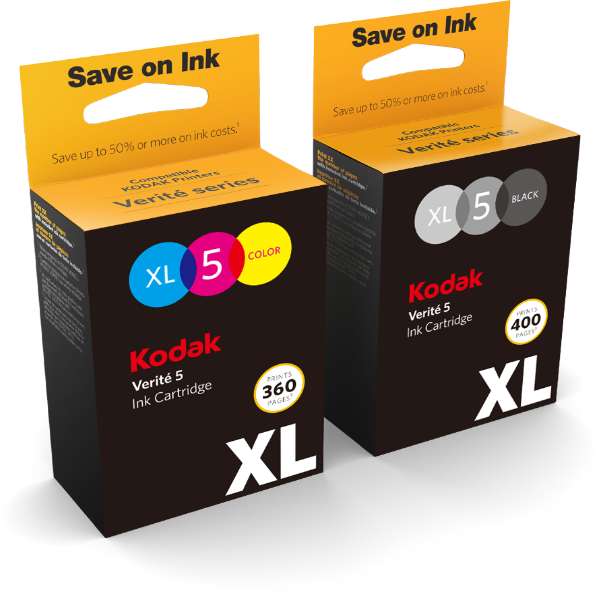 * Manufacturer’s Suggested Retail Price (MSRP) of included KODAK VERITÉ 5 XL Black and XL Color cartridges is $42. A >$64 value when compared to the CPP of other leading manufacturer’s ink cartridges for leading color inkjet printers less than $100, market share reported by NPD POS 2016. Ink page yield values for color graphics and text document obtained by continuous printing in accordance with ISO/IEC 24711. Actual results may vary. CPP is based on manufacturer’s recommended street price and page yield as reported by NPD POS Reports 2016 and manufacturers websites respectively. ** Up to 50% or more savings claim is based on the cost per page ("CPP") of replacement KODAK VERITÉ 5 XL or VERITÉ 5 XXL Ink cartridges as compared to the CPP of similarly priced branded cartridges for leading manufacturer's color inkjet printers less than $100, market share reported by NPD POS Reports 2016. CPP savings are less when comparing KODAK VERITÉ 5 standard fill to the leading manufacturer's standard capacity inkjet cartridges. CPP is based on manufacturer's recommended street price and page yield as reported by NPD POS Reports and manufacturers web sites respectively. Actual savings may vary depending on number of pages actually printed per month and content of pages printed.